Facebook Messenger, Facebook launched this application quite a time ago. Now it has over 1 Billion Monthly Active Users. Yes “1 Billion” Users. It’s not a joke. 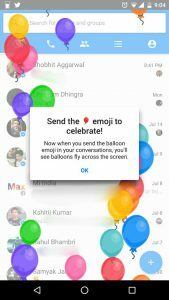 It is a milestone for facebook messenger team who handles the messenger. The Messenger team shared some stats that how messenger is loved by the people and how they are using on regular basis by sharing over a billion messages a month, More than 17 Billion photographs were shared on messenger in a month. That’s quite a big achievement and people are loving the messenger. Talking about Whatsapp and Instagram both are owned by Facebook, Instagram has 500 million active users and Whatsapp has over one-half a billion monthly active users. Facebook also claimed that messenger on iOS is 2nd most popular app. Developers over 23000 have signed up for the Bot Engine and Voice over LTE calls made globally by Facebook messenger is 10%. Which VOIP service you are using ? Which is best according to you. Don’t forget to tune in with Gadgetsparade for more such artciles and valuable information. Stay Subcribed on our youtube channel and Stay Healthy.